Malta is now offering residency and/or citizenship as well as an EU passport to prospective wealthy investors who wish to gain access to the vast EU market of 500 million citizens. The programme has been christened as the Malta Individual Investor Programme (Malta IIP). The Malta Individual Investor Program is an ideal tool for persons who are affluent and who have impeccable standing to receive Maltese citizenship. This procedure is also applicable for the applicant’s immediate family. As soon as the citizenship procedure is completed, the applicant (and their family) may work, live as well as study in any EU country. To fit the bill for the system the fundamental candidate must be no less than 18 years old and have a perfect criminal record. The primary candidate might likewise add wards to a citizenship application, including life partner, kids and grandparents. Principal applicant are required to make an Euro 650,000 commitment to the National Development and Social Fund. The commitment for a life partner and minor dependents is Euro 25,000 each. The commitment for ward applicants more than 55 years old and ward children between 18 – 26 years old is Euro 50,000. Notwithstanding the commitment, candidates must buy real estate in Malta through (an) acquiring real estate estimated at least Euro 350,000 or (b) renting a property at no not as much as Euro 16,000 every year, for at least five years. The land might be sold following a five year holding period. Candidates are likewise required to make a venture of Euro 150,000 in Government affirmed money related instruments to be held for no less than five years. The securities might likewise be sold following a five year holding period. Accessible to qualified financial specialists at a one-time program expense of roughly EUR 880,000. 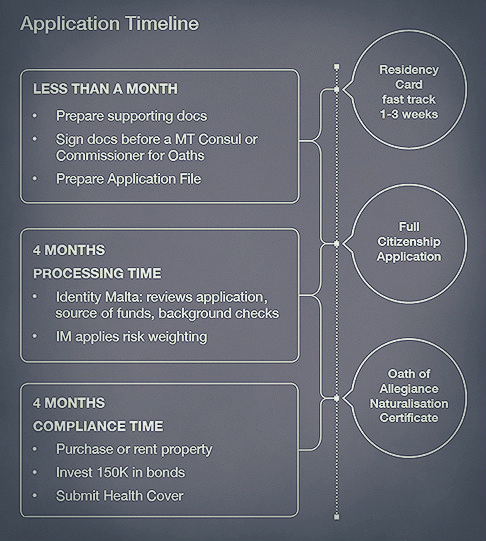 The citizenship application procedure can be finished in as little as 180 days. You can easily get in touch with us for an itemized cost gauge or classified counsel, or to get extra data. Our professional staff are prepared to help you with accomplishing your venture targets and answer any inquiries you may have about the greater part of Malta’s Residency/Citizenship by Investment programs. A Maltese passport offers the full benefits of a European Union citizen which includes travel without borders under the Schengen agreement. There’s also a waiver for travel to the United States as well as other countries such as Canada, the Middle East, Africa and Asia as well as several countries in Central and South America. Malta is a protected nation that appreciates a minimal effort of living record. The nation has for quite some time been a get-away spot for Europeans and high total assets people who run to the island for its sunny and warm atmosphere year-round. Malta offers an advanced framework going from solid telephone and network access to secure keeping money to entrenched air and ocean courses associating the island to the European terrain and global destinations. On account of the nation’s history as a previous British province the Maltese educational system mirrors the British structure. There are two school classifications: state schools and tuition based schools. State schools are allowed to all understudies (counting free transportation and free books), while non-public schools, for example, universal schools charge educational cost expenses. Contact us for a free, non-obligatory professional advice and receive detailed quote with confidential consultation (email, phone or in person).